Send us an email letting us know that you want to study with John. 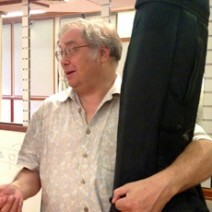 John Ray is a modern master of acoustic and electric bass and jazz styles and improvisation. Performances with Dizzy Gillespie, Roy Haynes, Buddy Rich, Harry Connick Jr., Branford Marsalis, Michael Brecker, Woody Herman, Joe Lovano, Barry Harris, Jaki Byard, Lenny White, Warne Marsh. Currently adjunct professor of jazz bass studies at C.W. Post College. A graduate of NYC’s H.S. of Performing Arts, Mr. Ray received his BMA in Bass Performance from Manhattan School of Music.